Layouts: There are three different types of site layouts available to design your perfect site. Vertical Navigation: You can have vertical header in a click for your sitewith boxed slider or full screen slider with full control on the elements placing using drag n drop header builder. Unlimited Portfolio: There are no limits to number of portfolio that can be added to your site. You can also choose from available hover styles to stylize your portfolios .The portfolios can be displayed in the following layouts. Big featured image followed by small images. Unlimited Colors with gradient support â€“ APRESS Theme comes with unlimited color options. You can easily set the color for the entire site globally or directly inside the elements. Fully Responsive: The APRESS Theme is fully responsive. Itâ€™s absolutely set and forget as both the theme and elements are tested for responsiveness across all devices like desktop, tablets and Mobiles. 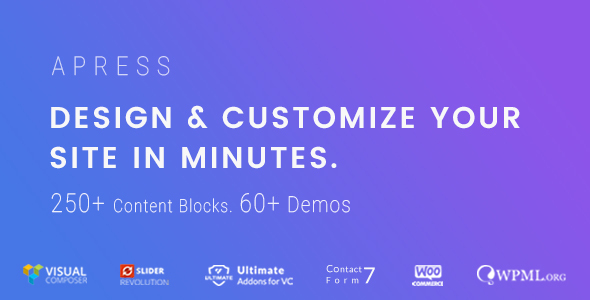 Premium Plugins: Apress is bundled with most popular premium plugins â€“ Visual Composer, Slider Revolution and Ultimate Addons For VC.